Pioneering work carried out by Maidstone and Tunbridge Wells NHS Trust (MTW) doctors was showcased at a special event this week in London (1 February). 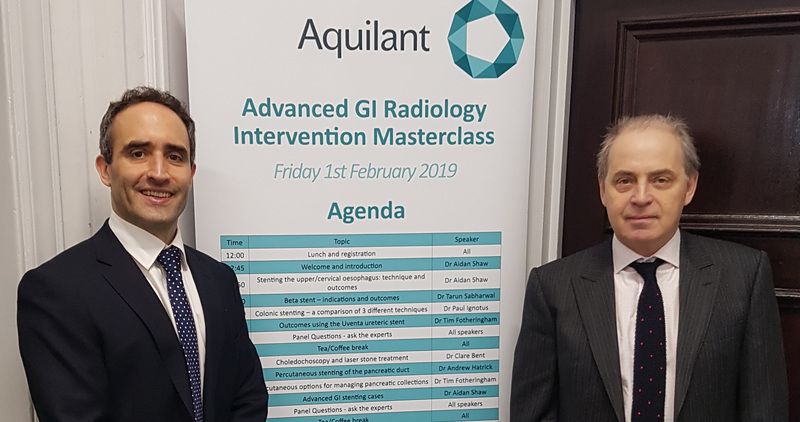 Two Consultant Interventional Radiologists from the Trust talked about the innovative techniques they’re using to improve the lives of patients with gastrointestinal cancers, as part of a national masterclass to share learning. Dr Aidan Shaw and Dr Paul Ignotus, who both organised the symposium, talked to 70 delegates about the ground-breaking best practice they’re undertaking using stents, which has received international recognition and acclaim. The pair have led the way in using particular types of stent to open up blockages caused by upper and lower gastrointestinal tumours, which has brought significant health benefits to patients. Dr Aidan Shaw said: “It’s been an honour to share our knowledge and skills at a national level with other clinicians. “We have developed innovative techniques to open up blockages caused by tumours, allowing patients, who previously may have been too unfit for surgery, to continue to eat and drink. This has avoided the need for these patients to have surgery, avoid a stoma and has improved their quality of life. Dr Shaw and Dr Ignotus first trialled this special type of surgery two years’ ago to help patients where traditional surgery was not an option. So far, 5 patients have undergone treatment, all of which have been successful. Pic shows: L-R Dr Aidan Shaw and Dr Paul Ignotus.